Enjoy a classic Outer Banks vacation experience with all the comforts of home and then some with a stay at the picture perfect Bristow's Bungalow. 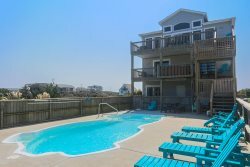 Located between the highways just before milepost 6, this beach retreat is wonderfully close to a host of restaurants, shops, and attractions, as well as the sunny Kill Devil Hills beaches, with a public beach access located just a 5 minute walk away. With a wealth of enticing OBX sites at your fingertips, Bristow's Bungalow is a fine launching point for any coastal adventure. The inside of Bristow's Bungalow is just as enticing as the location, with a sunny living area that boasts plenty of coastal touches and furnishings. Relax in one of three sweetly appointed bedrooms, or reconnect with the family in the central living, dining, and kitchen areas ,which are outfitted with everything guests need for a great meal or an evening of relaxation. Brimming with coastal style, Bristow's Bungalow is the ideal destination for a perfectly cozy and inspired beach vacation.